Apart from displaying the synthetics in groups (see Displaying Synthetics in Groups), you can also display the specific synthetics curve and delta curve of a well in section views against the seismic. Note: To generate the delta curve in Synthetics, see Displaying the Delta Curve. In the Synthetics window, open the Synthetic tab. 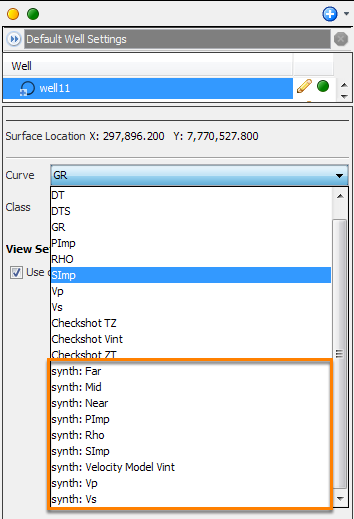 At the Well Curves section of the tab, select the Add output curves to Wells check box to allow you to select the synthetic curves in the Details Panel of the well. Type a Curve Prefix to be displayed before the name of the curve. In the Control Panel, open the Well tab. Select a well to open its Details Panel. At Curve, the list of the synthetics-generated curves will be available. Select a synthetics curve that you want to display for the well. 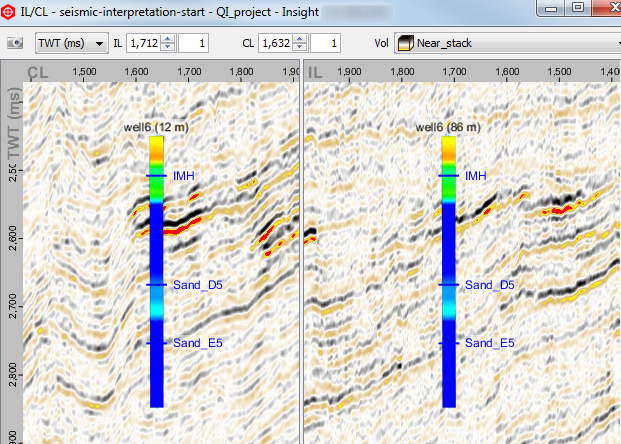 The following example shows a delta curve of a well in the section view (IL/CL View).